This interesting piece has three indentations set in the sides for cigarrette rests. They look as if they have seen use, but it also looks as if they were glazed to look that way. 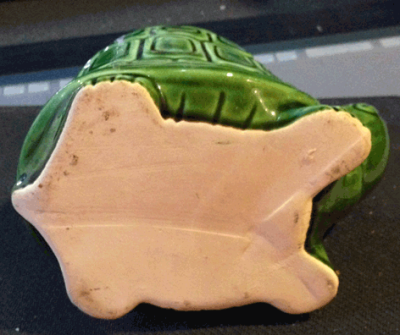 The tortoise has glazing on it with the same coloring as the cigarette rests. The inside of the bowl is bumpy and designed to look like tortoise shell. 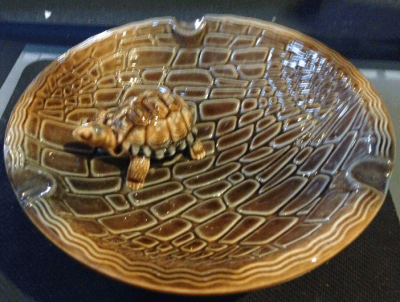 Inside the bowl a tortoise figurine appears to be trying to up the side of the bowl to escape. 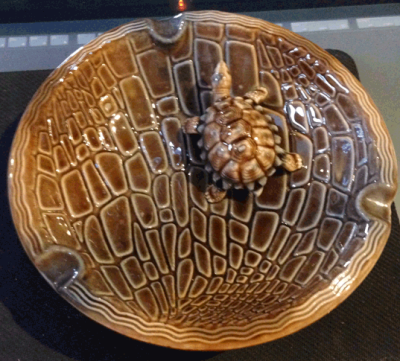 The bowl is glazed brown wth a tinge of black that gives a triangular shadow through the center of the bowl that can be seen very clearly in the pictures. 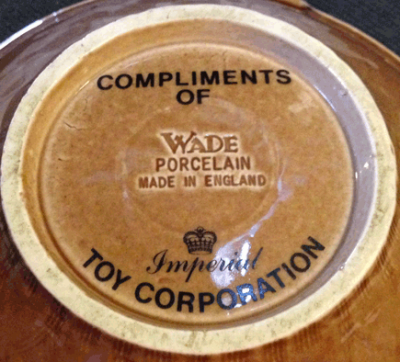 On the base of the ash tray , the words "Wade Porcelain Made in England" are stamped into clay in the center. 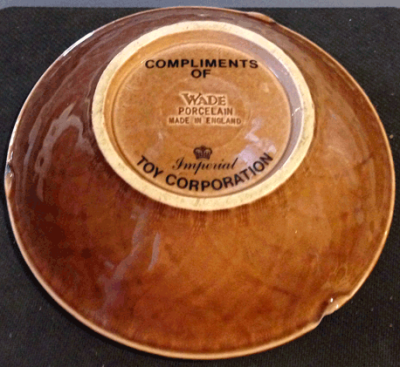 Around that, using a sort of decal glaze, are the words, "Compliments of Imperial Toy Corporation." This ash tray is not dated, but it has been n the possession of a single owner for over 30 years. 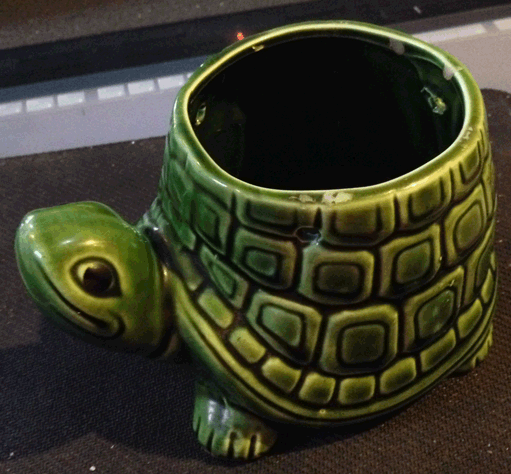 This ash tray is about 7 inches wide and stands just over and inch and a half high. It weighs 1 lb, 9.8 oz. This little ceramic flower pot has no maker's marks. The bottom has been painted white, but you can just make out the word "Japan" near the center of the base if you hold it to the light. 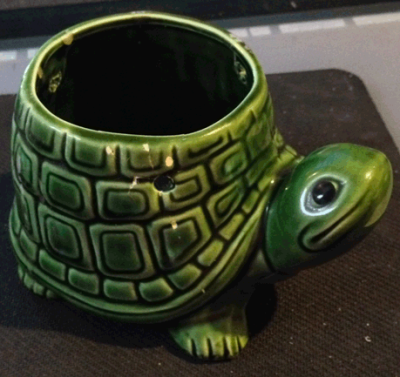 It's shaped like a tortoise and glazed with shades of green. It has 3 holes around the rim for braiding through a piece of macrame or other decorative hanger, so that it can be hung up and allowed to swing freely. This would be great for dangling ivy or spider plants. 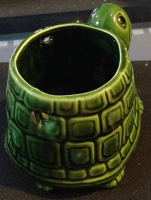 This little pot has been broken and repaired with glue, and chipping is apparent at the break site. It was also used as a candle holder at one time. This little planter is at least 35 years old. It's a little less than 3 inches tall, 5 inches long, and about 3.5 inches wide. It weighs 9 ounces.